Perfect itinerary for those who are interested in religious and spiritual tour. 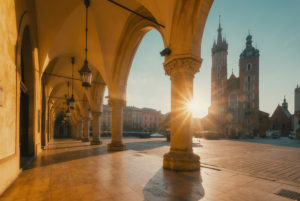 Not everyone knows Poland is a perfect destination for pilgrimages: it is the motherland of Pope John Paul II, there are places related to famous saints as well as important and beautiful sanctuaries to visit. During this trip you will get to know the interesting capital of Poland – Warsaw and beautiful Krakow. Welcome meeting at the airport or the train station with our driver who will take you to the selected centrally located hotel in Warsaw. Rest of the day free for leisure. Recommended activities: viewing terrace on the 31st floor of the Palace of Culture and Science, museums: Warsaw Uprising, Fryderyk Chopin, Museum of the History of Polish Jews, Wilanow Palace. Enjoy 6-hour introductory city tour conducted by a specialized English-speaking guide and private transport. Morning: you will see the highlights of the city, starting from the Old Town, carefully rebuilt after the II World War, with its market square, St. John’s Cathedral and the Royal Castle. Then we you will head up to the Lazienki Royal Park with the Palace on the Water. Afternoon: you will go to the church of St. Stanislaus Kostka – where the tomb of the beatified Jerzy Popieluszko is located, later on, a visit to a museum dedicated to Jerzy Popieluszko, a Polish Catholic priest, associated with the Solidarnosc movement. Popieluszko was declared beatified on June 6 in 2010 during a ceremony held on Pilsudski Square in Warsaw. Thanks to the visit to the museum you will know the history of Popieluszko’s life. Morning: We will arrange a transfer to the railway station, where you will board the express train to Krakow. The journey should not take more than 2,5 hours. After arrival to Krakow, our local driver will welcome you at the arrival platform and transfer you to the hotel. Afternoon: You will meet our local guide at the hotel’s lobby and start a 4-hour guided tour where you will have a chance to see places connected with life of Karol Wojtyla: 10 Tyniecka Street where he moved to from Wadowice in 1938, the house of Kanonicza Street where he lived as a bishop, and the bishop’s at 3 Franiszkanska Street with the famous window from which he greeted young people any time he returned to Poland, the Church of St Stanislaus Kostka where he celebrated his first public mass and St Florian’s basilica, his parish church in 1951-1958. At the end of the tour we will take you to the Archdiocesan Museum which displays a collection of sacral works of art, often withdrawn from worship, from the 14th to the 18th century. The museum’s objective is to hold on permanent display and make visitors familiar with the artistic legacy of the Cracow bishopric. Morning: Departure 130 kilometres to the north, to Czestochowa and visit the Jasna Gora Monastery, one of the most important pilgrimage centre in Europe. The objective will be to get familiar with its history and treasures like the miraculous image of the Black Virgin. In 1930 Karol Wojtyla (later Pope John Paul II) came with his father to Czestochowa for the first time and prayed to the Black Virgin. As Pope he has visited Jasna Gora seven times. Return to Krakow in the afternoon. There is a possibility to customize the program and its starting dates, adapting them to your needs and preferences – in case of any changes, the pricing is for request. We reserve the right to change the order of the visited objects depending on the availability of individual services. Loved it! Just the right amount of time for a tour and a TON of information on Poland that is unfortunately not taught in our schools. Highly recommend for Polish-Americans, Catholics, and people looking to see Poland from a different angle. The tour was wonderful. Got in everything we wanted to see and some extras.